How do you destroy two 110-story, steel-framed massive skyscrapers at near free fall acceleration, straight down into what should have been the path of most resistance? 9/11 Mysteries is a careful deconstruction of the official story of the “collapse” of the three World Trade Center (WTC) buildings–the Twin Towers and WTC-7–set alongside clean, clear science. 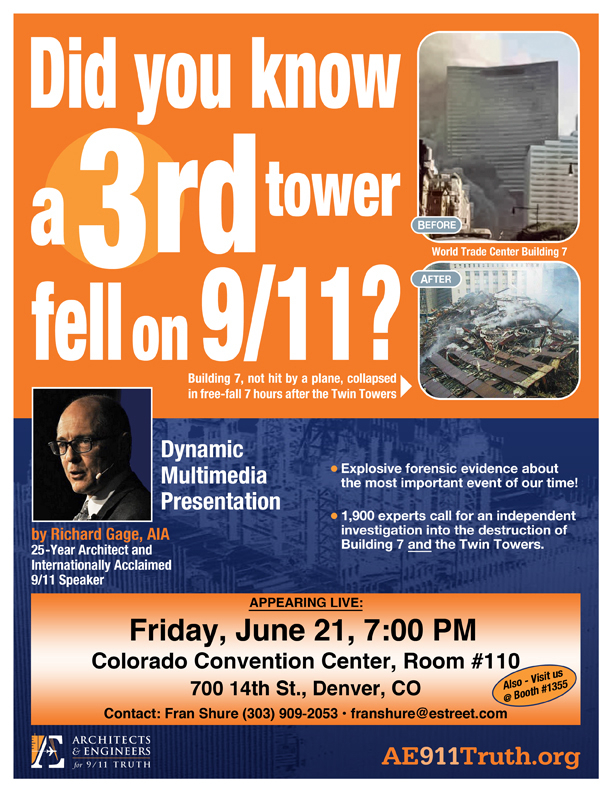 It is ninety minutes of pure demolition evidence and analysis, laced with eye-opening witness testimonials.The treatment of 9/11 is not one of politics or nationalism or loyalty, but one of strict and simple physics. This is the film you should bring your still skeptical friends to watch. It reaches out to mainstream America with–no agenda, no finger-pointing–just the facts and scientific evidence and analysis. It is a story of eyewitnesses: World Trade Center worker William Rodriguez’s recollection of explosions in the sub-basement levels several seconds before the airplane crashed high above and of strange noises on the 34th floor; and Scott Forbes’s recounting of power-downs and evacuation drills in the towers in the days and weeks before 9/11, and of strange construction and drilling sounds coming from the adjacent floors above. Who and what were causing the unusual construction-like sounds and dust in the towers just weeks before the towers fell? This is also the story of blasting technique: how shaped charges are strategically placed to slice through steel beams, allowing total control of how a building falls. This information sheds light about how a building can be purposely rigged to collapse and thus sheds insight into what happened on the fateful day of 9/11. Excellent. The best of the 9/11 movies. WOW! is my reaction to this movie. A superb work and asset to the patriot community and America itself. 9/11 Mysteries still is one of the best 9/11 films available. It provides the most compelling facts alongside the most professional production, and has thus been widely praised by film critics and academics alike. Refreshingly, the film is devoid of the emotional sparring that so often surfaces in this highly charged subject. Rather, in honor of those who lost their lives on that fateful day, the film seeks to discover the full truth through an objective, evenhanded look at physical evidence, eyewitness testimonials, and expert analysis. You will find no name-calling, politicking, or crass appeals to emotion. Through its careful investigation of the facts, the film shows how the “official story” not only fails to adequately explain the events of 9/11 –– it actually flies in the face of hard science. How can a 110-story building collapse at near free fall acceleration? What happened to the undamaged steel core columns? How was it possible that molten steel simmered under Ground Zero for months after the collapses, when jet fuel fires could not have melted the steel? These questions are not even addressed in the 9/11 Commission Report. Another mystery is WTC-7, a building that housed the U.S. Secret Service, the Department of Defense, the Mayor’s Office of Emergency Management, the IRS, the CIA, and the U.S. Securities and Exchange Commission, which housed over 3,000 case files of damning documents pertaining to the investigation of Wall Street corruption and insider-trading, such as the Citigroup and the Enron scandals. Although virtually ignored by mainstream media, WTC-7 also “collapsed” at near free-fall acceleration on 9/11. However, it was not hit by any airplane, and only suffered minor damage, and yet it too came straight down at 5:20 PM on 9/11 in 6.6 seconds. Clearly, there is more to the 9/11 story than is being portrayed in mainstream media–or by the National Institute of Standards and Technology (NIST). Please join us for the screening of one of the classic 9/11 documentaries examining the evidence of destruction of the three World Trade Center skyscrapers, and for a discussion following the film. Mark your calendars! Colorado 9/11 Visibility Video and Action Meetings are held the 3rd Friday of each month in Denver. Mark your calendars! Boulder 9/11 Visibility Video and Action Meetings are normally held the 4th Wednesday of each month.